A delicious Mauritian hearty, spicy and tangy dal or lentil soup (halim). 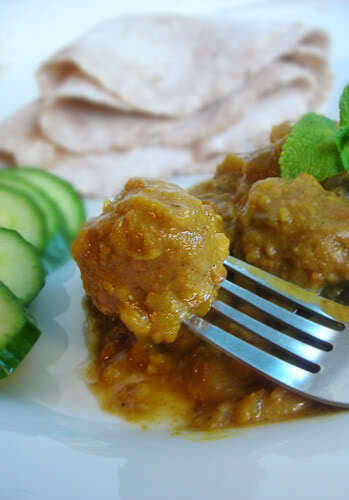 This is a healthy vegan vegetable haleem recipe made with soy meatballs and eggplant. I made this Vegetable Haleem dish some time during last week and BoyfriendLovlie said this was The-Most-Fabulous-Vegan-Dish I have ever made! Uh! What about the other food I’ve made so far? Well, I think I’m going to take this one as a compliment. I think the reason he liked it so much is because it was very close to the meat version he used to have! But I agree, this vegetable haleem recipe was really delicious and much better than the meat version! Much much better than I anticipated! It is based on a very popular Mauritian soup dish called Halim or Haleem. So popular that this is even sold as a hot soup in mini food stalls or caravans on street corners! I very rarely feature Mauritian dishes here although Mauritius has a rich food heritage. With the country being multicultural from history, it has a fabulous marriage of cuisines – from Chinese, Indian, Creole style to European. I think Halim originates from Pakistan or the Persian regions. However, in Mauritius, this has been adapted with Indian spices, the use of Chinese chives or scallions as garnish and traditionally served with French bread. Vinegar or lemon juice can also be added to the soup just before serving. While Halim is basically a high calorie meat dish ladened with ghee and high fat mutton or beef, my version here is a low-fat vegan one with a slight twist; I have added in some aubergines (or eggplants if you prefer). 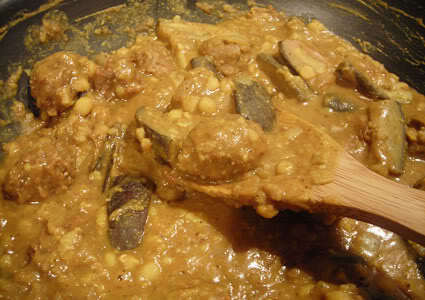 Eggplants in dal soup is another Mauritian delicacy! Traditional Halim recipe calls for cracked wheat or bulgur wheat. Shame that I did not have any; it’s a very tasty addition. Feel free to add in 4 – 5 tablespoons to soak together with the dal if you happen to have some cracked wheat. I have added it to the recipe in case you are incorporating this ingredient. 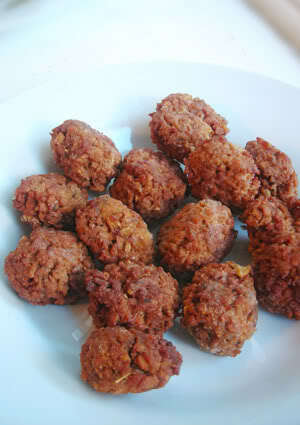 The ‘Meatless’ Balls are adapted from Joni’s Swedish Meetballs recipe. I changed the spices and used minced soy meat instead of TVP. 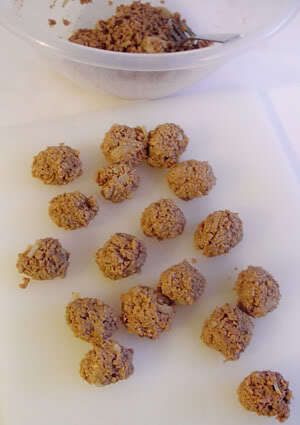 The minced soy meat required less liquid to be rehydrated. I also did not use wheat gluten as I did not have any, but they were still great! BoyfriendLovlie adored the meatless balls on their own. I kept some of them (just the meatless balls) in the freezer and we even had them the next day as a sandwich-filler with salad! They’re great to freeze too if you want to make them in advance. I think I’m going to make them into burgers next time. 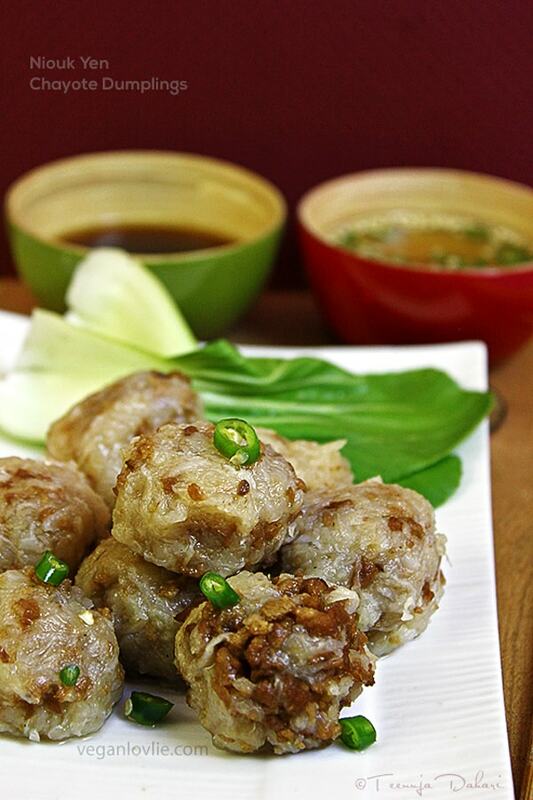 Rehydrate minced soy meat by pouring boiling broth over the dry flakes, cover and let sit for 10 minutes. In a non-stick pan, sauté the onions and garlic in vegetable oil until translucent. About 5-7 minutes. Mix this in the minced soy meat. Add the flour and all of the spices including Tabasco (just don’t put your finger in your eyes afterward, when handling!). Let sit until cool enough to handle. With your hands, form balls about 2.5 cm or 1 inch in diameter. The balls should be firm enough so they don’t fall apart in the oil. 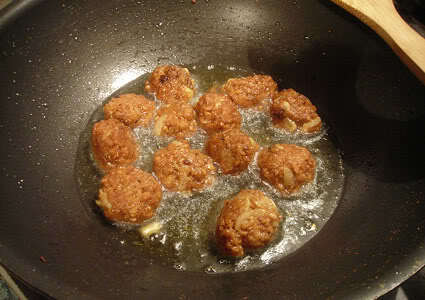 Fry them in oil (allow them to be ⅓ immersed), rolling them around in the pan to brown on all sides. You may need to adjust the heat (i.e. oil should not be too hot) so that the inside is thoroughly cooked as well. Boil dal together with the cracked wheat and some salt until dal is soft but still whole (about 15 – 20 minutes). If you are using a pressure cooker, time it so the dal is not completely disintegrated. Drain (but not completely) the water into a bowl (you will use this water later if you need to add sauce). Keep both dal and water aside. A little note here: it is best not to use too much water to boil the dal as you will lose a lot of nutritious water otherwise, just use enough so that it doesn’t dry up and you can still use the rest as sauce addition. 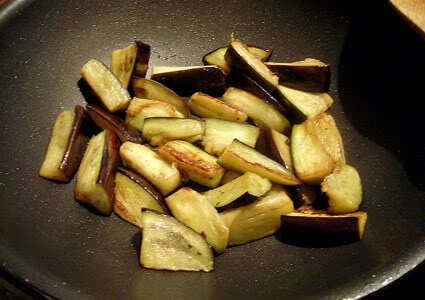 While the dal is cooking, you can prepare the eggplant slices. Fry them in 2 tablespoons of vegetable oil until soft and lightly browned. Set aside. Place cumin, curry powder, turmeric and minced ginger in a bowl. Add some water and stir to form a paste. Set aside. In a deep sauce pan (non-stick preferably), melt vegan margarine. Add in onions and garlic. Saute until translucent. Add the curry paste. Add water (from the drained dal) if required. Stir and allow spices to roast for a while. 5 – 7 minutes. Add more water if required. Add in the dal with some water. Stir and mix well. (The amount of water you add will depend on how thick you want the soup to be. I like thick soups, almost curry-like but if you prefer thin soups, this is also fine). Add soymilk for a creamier consistency. When the soup has almost reached the consistency you want, add the meatless balls and the pre-fried eggplants. Stir and mix well. Allow to reduce and thicken slightly. Add salt to taste. Serve hot with Indian or French bread. (I had chapattis!) Or just as a spicy soup on its own with some scallions and freshly squeezed lemon juice for a fresh tangy taste. 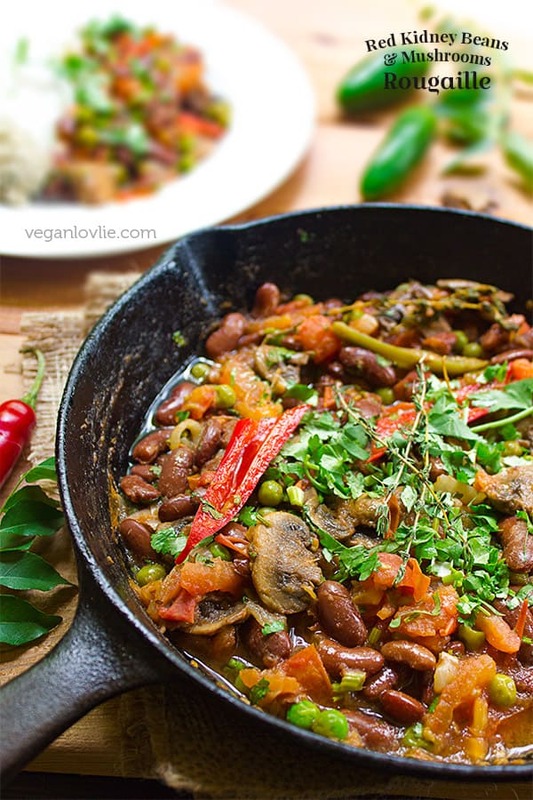 Do you feel like some delicious heartwarming Mauritian inspired dish tonight?! A spicy curried dal soup with meatless balls and eggplant – delicious Mauritian spicy and filling dal soup (halim). 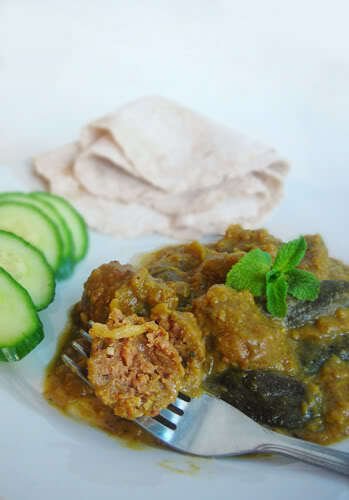 This is a healthy vegan haleem recipe version made with soy meatballs and eggplant. This soup is often enjoyed with some crusty bread. 1 teaspoon mild curry powder, or hot or just your favourite one! In a non-stick pan, sauté the onions and garlic in vegetable oil until translucent. About 5-7 minutes. Remove from heat. With your hands, form balls about 2.5 cm or 1 inch in diameter. The balls should be firm enough so they don’t fall apart in the oil. Drain (but not completely) the water into a bowl (you will use this water later if you need to add sauce). Keep both dhal and water aside. In a deep saucepan (non-stick preferably), melt vegan margarine. Add in onions and garlic. Saute until translucent. Add the curry paste. Add water (from the drained dhal) if required. Add in the dhal with some water. Stir and mix well. (The amount of water you add will depend on how thick you want the soup to be. I like thick soups, almost curry-like but if you prefer thin soups, this is also fine). Add soy milk for a creamier consistency. Love this Vegan Vegetable Haleem recipe? Don’t forget to pin it for later. You are amazing! That looks so good. This looks and sounds totally delicious! I hadn’t realized how interesting Mauritian food is – thank you for writing this post. The meatballs look AMAZING! What kind/brand of soya meat did you use for them? I’d like to give them a try (I usually buy ‘Realeat’ frozen veggie mince but I think it might be too chunky for this recipe).<BR/>Thanks for another delicious recipe! Becks, I bought the mince soy meat in the Asian store over here. It’s the East End brand. But I’m sure I’ve seen this in some Tescos in London (Indian/Asian aisle), I’m not sure about other areas in the UK. You can get it at Holland and Barrett too. <BR/>There’s a chunky one which you can always mince down in the food processor after rehydrating if you can’t find the mince one. wow, Lovlie – your dish looks absolutely amazing! dan &amp; i are going to have to try it out! so far we&#39;ve only been able to find TVP, but i&#39;ll definitely look for some soy meat at our asian market – i bet they have some! 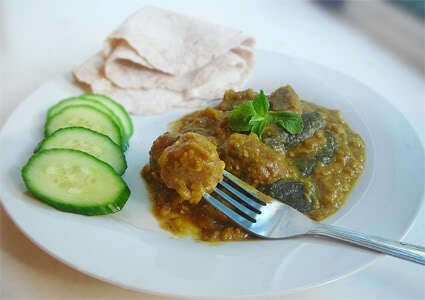 <BR/><BR/>i love a good dish with eggplant &amp; curry – yours looks too delicious not to make! thanks so much for the recipes! mmmmmmmmmmmm! I’m totally going to make these! I love your blog. I only found your blog for the first time today and I am seriously impressed. Wow your food looks amazing! Oh, this looks truly amazing! Thanks for the recipe! I think I visited your blog before. I saw your link during that blog thing at Island Crisis. 🙂 <br /><br />I was looking for information about halim because a friend was asking me about halim and I came across this blog entry. What a coincidence! hehe<br /><br />Do you know what type of vinegar we use in halim? Strangely, I haven’t found the same type of vinegar when I was still in Shanghai. The vinegar we get in Mauritius is very different in taste. I also don’t find it here. I don’t know what they use to make it, probably sugarcane syrup…<br /><br />The closest I’ve been able to reproduce it is by diluting brown malt vinegar (1 part malt vinegar : 4 parts water). Malt vinegar is very strong though and the smell is different.<br />But I find rice vinegar quite good for halim soup. 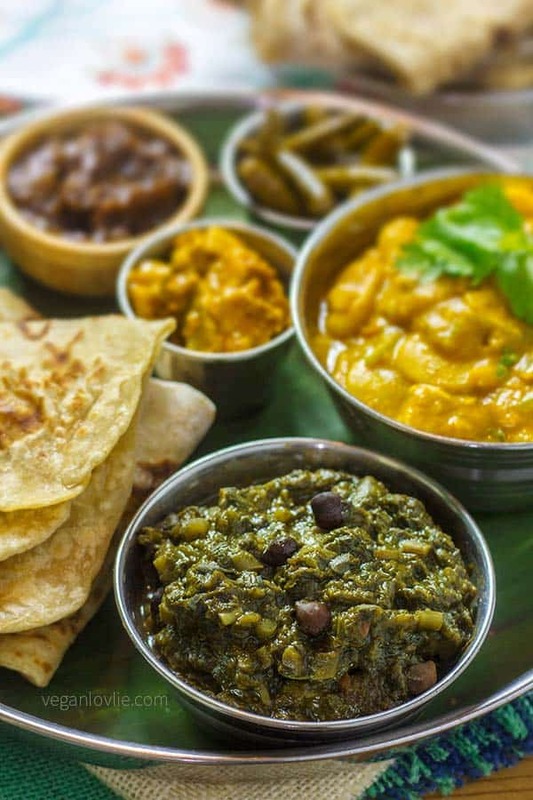 You forget not only the indian and chinese cuisine is influenced in mauritiaus but AFRICA as well. Dont forget it. I hate it when you asian obmitt that when you all know how you lot pretend how you end up on the island in the first place. Need to readup on the dalit people of south india. Then it would take the prejudice and ignorance out of you.